English-language official documents from the Persian Corridor period continue to make the word "Persia" interchangeable with the name of Iran. In correspondence by the government of the United Kingdom, usage of "Persia" over "Iran" was chosen by Winston Churchill to avoid possible confusion with neighbouring Iraq. The presence of so many foreign troops in Iran accelerated social change and it roused nationalist sentiment in the country. In 1946, Hossein Gol-e-Golab published the nationalist song Ey Iran; it was reportedly inspired by an incident during the war in which Golab witnessed an American GI beating up a native Iranian greengrocer in a marketplace dispute. 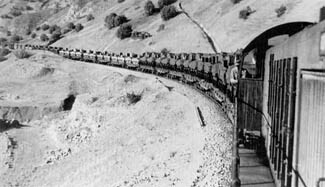 To help operate trains on the demanding Trans-Iranian Railway route, the US supplied large numbers of ALCO diesel locomotives, which were more suitable than steam locomotives. About 3000 pieces of rolling stock of various types were also supplied. ^ "THEY HELPED- RUSSIA TO VICTORY". The Port Macquarie News and Hastings River Advocate (NSW : 1882 - 1950). NSW: National Library of Australia. 28 April 1945. p. 4. Retrieved 25 May 2013. Wikimedia Commons has media related to Persian Corridor. Coakley, Robert W. (2000) . "Chapter 9: The Persian Corridor as a Route for Aid to the USSR". In Greenfield, Kent Roberts (ed.). Command Decisions. Washington: United States Army Center of Military History. CMH Pub 72-7. This page was last edited on 13 March 2019, at 10:20 (UTC).